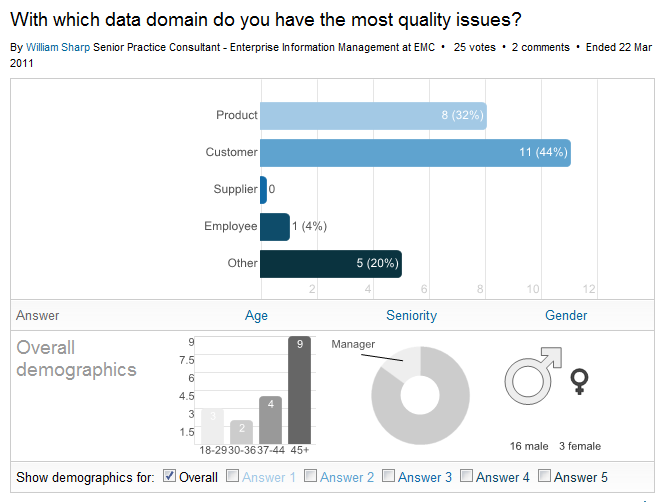 As expected, customer data quality remains at the top of list with regard to having the most issues. Ironically, this domain has been at the forefront of the data quality industry since its inception. One reason for the proliferation of concerns about customer data quality could be its direct link to revenue generation. Whatever the reason, this poll seems to indicate that services built around the improvement of customer data quality will be well founded. Once again there are no surprises when looking at what data improvements are desired. 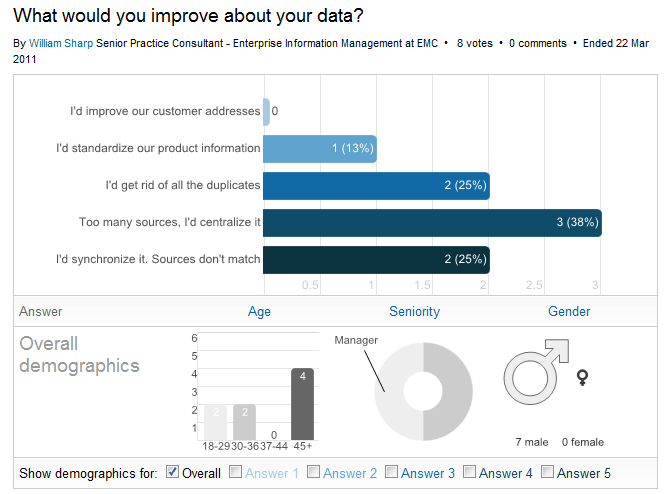 Data owners seem to be interested in a centralized, synchronized, single view of their data, most notably customer. The good news that can be gathered from these polls is that as an industry, data quality is focused on the right data and the right functionality. Most data quality solutions are built around the various aspects of customer data quality and ways to improve it so there is a master managed, single version of a customer. The bad news is we’ve had that focus for quite some time and data owners are still concerned. In my opinion, this is due to the nature of customer data. Customer data is at the core of every business. It is constantly changing both in definition and scope, it is continuously used in new and complex ways, and it is the most valuable asset that an organization manages. One thing not openly reflected in these polls is that it is likely that the same issues and concerns that are present in the customer domain are also present in the employee and contact domains. However, they tend not to “bubble up” to the top of list due to lack of linkage to revenue and profit. I’d encourage comments and feedback on this post. If we all weigh in on topics like this, we can all learn something valuable. Please let me know your thoughts on the poll results, my interpretation of the results and opinions. Recently a reader asked me if I had any posts on “data quality basics”. Turns out, I didn’t. So I’ve decided to put together a series of posts that covers what I feel are the basic essentials to a data quality program. As a follow up to my previous post, I have compiled a checklist that can used to manage the effort of preparing for a data quality engagement.